The Space Pirates bought a contingent of Tallon Metroids to their operations upon planet Aether. Upon initial contact with Ing forces originating from Dark Aether, an outright attack against the Space Pirate forces commensed. 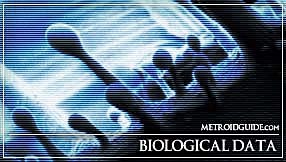 As well as infecting large amounts of the Space Pirate task force with their dark matter, the Ing were also able to secure a small number of Tallon Metroids intact. Fascinated by the biological properties of the Metroids, the Ing, following in close footstep with the Space Pirates, sought to use them as a weapon to defeat their foes, the Luminoth. It was not long before the highly poisonous enviornments of Dark Aether took the mutative hold of the Tallon Metroids, thus resulting in an entirely new strain, the Dark Tallon Metroids. In basic concept, a Dark Tallon Metroid is simply a Tallon Metroid taken over by Ing infection.This strain is roughly twice the size of a normal Tallon Metroid. If they are damaged are unavailable to find food the creature will absorb Phazon to grow stronger and larger. 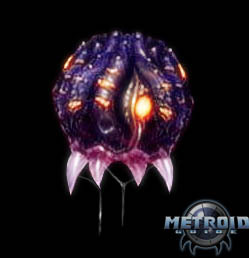 Like normal Metroids the Dark Tallon Metroid drains the "lifeforce" of it's prey for energy. Due to the total infusion with dark matter, this strain is now extremely vulnerable to light. It's overall body seems to have grown cancerous tubers all along it's outer carapace. The purpose of these growths is not known, yet speculated to have something to do as a side effect of the dark matter coursing thru them. This may also be a natural adaptation to the higher pressures of Dark Aether's enviornment. Optical sensory organs sensitive to light and movement also sprout up along the sides of the carapace. The fangs of the Dark Tallon Metroid become much more portrusive, though overall they appear to be slightly smaller than their Tallon relatives. A thick coating of saliva keeps them lubricated to more easily penetrate their prey. These Metroids have developed a very strange "pack instinct" which is extremely uncommon in Metroid society. 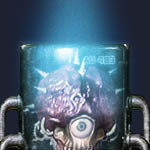 The Ing infection has caused the Metroids to want to stick together, search out a specific area, and find prey. After prey is located they bring it to where their den has been established, usually in an isolated area. It is here that they deliver the prey. Once enough food has been found the Metroids devour everything in the pile and repeat the process. The Ing are fascinated by Metroids and their connection to Phazon. It is not a shared fascination, as Metroids will attack Ing on sight. Recognizing their strength, Ing darklings have possessed a number of Metroids, turning them into powerful soldiers of the Horde.